The Moorings has two double bedrooms, one with a King size bed and the other with two single beds and a sofa bed in the lounge. The apartment ideally would suit 5 people as the sofa bed is a bit uncomfortable for two adults. The Apartment offers all the modern conveniences and, as it has all been recently replaced, everything is in perfect order with a brand new kitchen and shower room. From the balcony as well as being able to see the sea, there are also amazing views over the tree tops of the famous chine. The apartment is one of six in the block so you will be aware of people above below and alongside you. 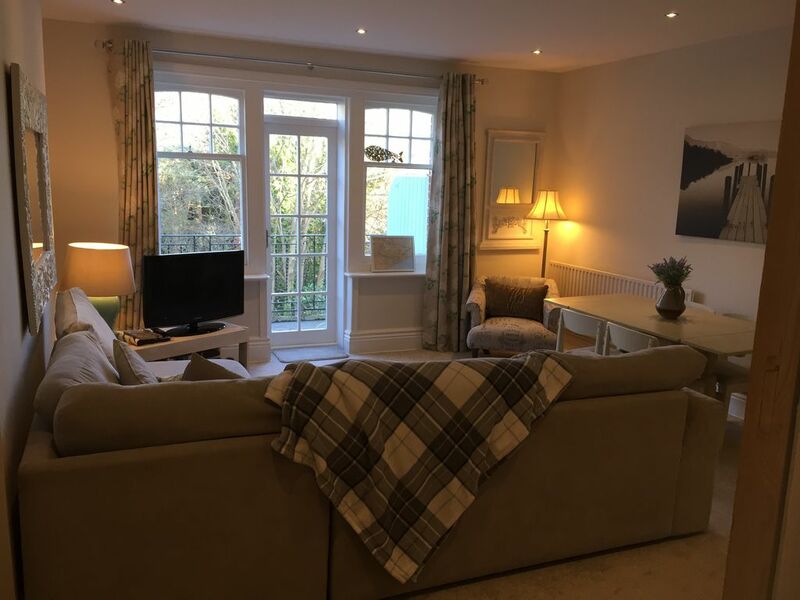 It is ideally situated, making it the perfect base to explore the area by car or bike, such as the world famous Jurassic coast and the beaches and heathlands of Studland bay, only a short ferry ride away. For the more active holiday makers, water sports and golf facilities are within easy reach. For families with young children Alum Chine has a wonderful play area newly refurbished (2018) on the beach next to Vesuvio restaurant where parents can sit, relax and have a drink whilst keeping an eye on the kids in the park. The apartment lies within a twenty minute walk along the promenade to Bournemouth pier or 5 minutes if you catch the noddy train to all the attractions of Bournemouth town centre including fabulous shopping, restaurants and bars. A fifteen minute stroll up the tree lined chine takes you to Westbourne village again offering quaint shops, good restaurants and bars as well as a Marks and Spencer food hall, a Tesco express, a butchers and bakers etc. Heading West along the promenade will take you to the stunning Sandbanks beach with all its water sports and recently opened Rick Stein's latest restaurant amongst others. Alum Chine beach 5 minutes walk. 20 Minutes walk with all the shops, restaurants, bars, cinema, clubs you would need. Westbourne village is a 15 minute walk up the chine away with great restaurants, Bars, cafes, M&S food hall, Tesco express a Victorian Arcade with an array of eclectic shops. Tea coffee and a pint of milk supplied for a cuppa when you first arrive. Balcony has a view of the sea. Close to beach super location!! Everything was clean & tidy and well presented... shower could of been hotter!! Personal choice I guess? Maybe a control on it to stop people burning themselves? Overall great place to stay. Thank you for your review. I am pleased that on the whole you enjoyed your stay. Thanks for your feedback about the shower. We will certainly get that checked out. Great location, the apartment had everything that we needed. Thanks! We enjoyed a very comfortable few days here. The walk to the beach from the chine was lovely. Many restaurants on the beach and promenade so spoilt for choice. Nearby Westbourne has many highly recommended restaurants and we can testify they are as good as they say! The new Odeon in Bournemouth is wonderful with reclining leather sofas (pay bit extra) but town itself is a bit run down. The owners live on site and were most helpful and responsive when a problem arose and allowed us to stay on a bit longer at the end of the stay so I cannot rate them highly enough! Many lovely walks nearby with the dog. What’s not to love?! We had a fantastic couple of nights away. The apartment was spotless, ideally located, really well equipped (including good wifi) and perfect for us and our 3 year old. Helen was very friendly and helpful and we wouldn't hesitate to recommend. A great stay in a super well equipped apartment. Thanks ! Close to the beach for walks to Bournemouth and Poole, and great restaurants in nearby Westbourne. A lovely break. So pleased you had a lovely time. Bournemouth can be great in the off season, with lovely walks along the miles of near empty beaches. We hope you will come back very sooner. If you check the Bournemouth Tourist information website you will find events happening though out the year.